When I look to the left of my screen in my home office, this picture on a place mat is what I see. The second ship to be called MV Abegweit was the pride and joy of the Marine Atlantic fleet, just like her older namesake. As with the original Abby, this one was a railway and car ferry which transported traffic on the Cape Tormentine, New Brunswick to Borden, Prince Edward Island route. Martine Atlantic (formerly CN Marine) worked brilliant marketing campaigns for this ship by selling merchandise such as the place mat which I own. I also remember shot glasses and postcards existing with this picture. There was probably more. With completion of Confederation Bridge, The Abegweit and her sister ships were no longer needed with the closure of the ferry service. The sad end of this glorious ship started once they completed using her as a cargo ferry hauling equipment to the Marine Atlantic docks and offices in North Sydney, Nova Scotia. The ship was only 17 years old when she was declared surplus. She sat docked in Sydney for many years until being sold to a Texas firm known as “Accrued Investments”. The new owners failed to end up even using the Abegweit for any purpose. The Abegweit made news when it was revealed that her owners at the time had placed her for sale on E-Bay at a price tag of 6 million U.S. dollars. In January of 2004, The Abegweit was sold to an Indian Shipping company, although would be registered by a Kingstown, St. Vincent corporation. 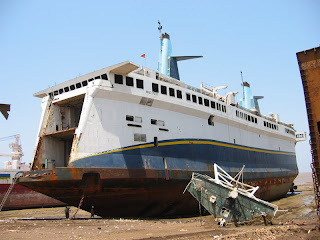 This is apparently the last photo in existence of the Abegweit, at this time renamed MV Mariner and in the Alang, India Shipbreaking Yard. She was scrapped in early summer 2004. Marine Atlantic had said the costs of refitting The Abegweit with all the necessary means to turn her for use on the Cabot Strait were too costly. Given the age of the ship, it is still a mystery as to why this great ship was not just simply moved to the Northumberland Ferry Route between Caribou, Nova Scotia and Wood Islands, PEI. 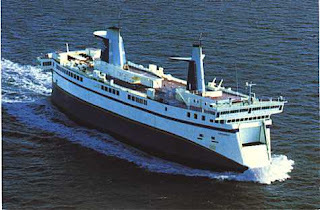 The Government elected instead to transfer the older yet still capable MV Holiday Island out of necessity to replace several other aging ships. This ship was taken from her country too fast and too soon. Had she been kept around, a longer life on the Northumberland Strait would be her continued story today. The older MV Abegweit thankfully still lives as the headquarters for the Columbia Yacht Club in Chicago, Illinois. Anyone in the Chicago area should check out this legendary ship and think of the one that came after her while you are having a look. Posted in Notes from the Frogpond.Tagged Abegweit, Alang, Alang India, Borden, Cape Tormentine, Caribou, Chicago, Columbia Yacht Club, Ferries, Ferry, Illinois, M.V. Abegweit, M.V. Holiday Island, M.V. Mariner, New Brunswick, North Sydney Nova Scotia, Northumberland Strait, Prince Edward Island, Shipbreaking, Wood Islands. Oh shoot, Dann. I remember back in the 1990s wanting badly to ride that to PEI. I never made it. Shoot.